If not everything, timing is at least almost everything in the smartphones world. Every day brings fresh excitement over snazzy new smartphones like LG4, YotaPhone 2, ZenFone 2, Galaxy S6 and Xiaomi Mi4i . But there’s barely a pipsqueak about Ubuntu phones. Even the little news that trickles out turns out to be all bones and no meat. A lot of us are familiar with the Ubuntu Linux distribution that powers desktops and servers but what exactly is an Ubuntu Phone? Smartphones running on an optimized version Ubuntu Linux are popularly referred to as Ubuntu phones. Right now, only two vendors are selling the Ubuntu phone – BQ and Meizu, both in a limited way. BQ, a Spanish electronics retailer, is peddling the Aquaris E4.5 Ubuntu Edition (4.5 inch screen, 1GB RAM, 8GB usable storage, 8MP rear camera and dual SIM) in Europe. In mid-May 2015, Chinese firm Meizu started ‘selling’ the Ubuntu MX4 (5.36-inch, 2GB RAM, 16GB usable storage, 20.7MP rear camera) in China but only to developers. Meizu intends to sell to consumers in a few months and has signalled plans to enter the European market soon. The MX4 costs $290. So is Ubuntu ignoring the US Market? No. While Ubuntu phones are still not available for purchase in the US yet, parent company Canonical has previously announced its interest in the American market too. Don’t be surprised to see an Ubuntu phone landing in the US in the second half of 2015. 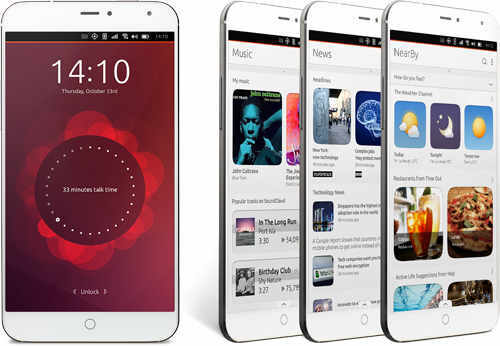 Why do I think Ubuntu faces daunting odds in making headway into the smartphones world? The biggest mistake Ubuntu made with its phone is being late to market. By the time the Ubuntu phones arrived, albeit in a limited fashion, Apple’s iPhones and Android phones from Samsung, LG, Xiaomi and other vendors had already cornered the market. Today, the Ubuntu phone has to contend not only with the iPhone and scores of Android smartphones but with a resurgent Windows phones and the cheap Firefox OS phones as well. Then there’s the issue of getting developers to write apps for your device. I don’t see developers giddy with excitement over writing new apps or porting existing apps to the Ubuntu phones. A smartphone without thousands of apps is merely an expensive paperweight. Does the Ubuntu phone have a chance of success in this overcrowded market? Not unless there’s a miracle. As things stand, Ubuntu has a ways to go before its phones are widely available and gains interest from app developers. Now as to Ubuntu’s grand ‘convergence’ scheme where the phone, tablet and PC (by connecting to a larger display) could all be a single device, it’s increasingly starting to look like a pipedream!